Like as the waves make towards the pebbled shore, So do our minutes hasten to their end, Each changing place with that which goes before, In sequent toil all forwards do contend. Nativity, once in the main of light, Crawls to maturity, wherewith being crowned, Crooked eclipses 'gainst his glory fight, And time that gave doth now his gift confound. Time doth transfix the flourish set on youth And delves the parallels in beauty’s brow; Feeds on the rarities of nature’s truth, And nothing stands but for his scythe to mow. And yet to times in hope my verse shall stand, Praising thy worth, despite his cruel hand. All of them in a sequence, striving forwards. And time ruins the gift that it gave to him. And nothing stands that his scythe can't mow down. Praising your value, despite time's cruel hand. Kim, Suzy. "Shakespeare's Sonnets Translation." LitCharts. LitCharts LLC, 11 May 2014. Web. 22 Apr 2019. Kim, Suzy. "Shakespeare's Sonnets Translation." LitCharts LLC, May 11, 2014. 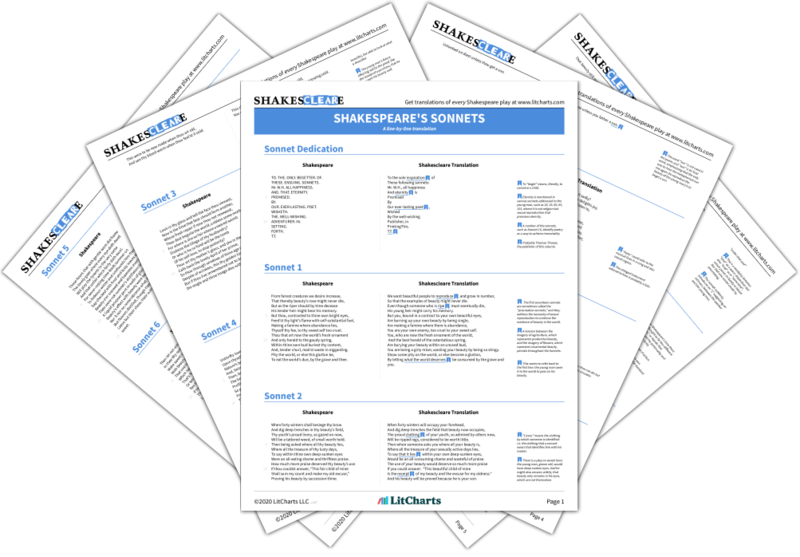 Retrieved April 22, 2019. https://www.litcharts.com/shakescleare/shakespeare-translations/sonnets.